Ever feel that the constant demand to keep your house clean and tidy is an endless struggle? At Magic Freshness, we provide domestic cleaning services which fit into your lifestyle, taking that daily burden away from your day to day activities. We are a UK recognised Domestic Cleaning Agency based in Essex. Our Cleaning Agency specialises in providing private household with vetted and selected cleaners & Ironers in Essex on a one-off or regular basis. Our outstanding customer care ensures our job at Magic Freshness Cleaning Services is not just to place a cleaner with you but also provide on hand support to make sure you are happy with the service we are providing. Magic Freshness cleaners are rigorously screen and selected before placing them with clients. Only the best quality cleaners are accepted onto our database. We are one of the most competitive cleaning agencies around coupled with reliable and quality service. We give you periodical calls to make sure things are going on well with you and your cleaner and ensure you are getting the highest quality which we take pride in. Magic Freshness's definition of deluxe clean is just that. My skirting boards were cleaned, the beds were moved n all cleaned out, my kitchen walls were scrubbed of all the grease, my grubby toaster didn't escape the cleaning as well. I misplaced my glasses for about 2 weeks before they attended the house n it was found whilst the bed was being moved. Need I say more.... I will definitely be using them again n recommending them to others. Kudos.. They were able to respond quickly to our plea for help with cleaning just before we moved into our new house and did a good job in difficult circumstances! 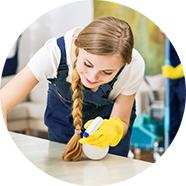 Find out more about our Professional Cleaning Services. Our cleaners are highly trained, full-time professional cleaners; reliable, fully insured & DBS checked.